reports of various struggles, movements etc. 22 जून की रात एक लोकल ट्रेन ईएमयू से दिल्ली से बल्लभगढ़ जा रहे एक 15 साल के मुसलमान युवक जुनैद को ट्रेन में आवारा भीड़ ने पीट-पीट कर मार डाला. इसमें उसके भाई हाशिम और शाकिर भी बुरी तरह से घायल हो गए. हाशिम को हॉस्पिटल से घर भेज दिया गया जबकि शाकिर अभी एम्स के ट्रॉमा सेंटर में भर्ती है. नीरज (दिल्ली आइसा सचिव), संतोष राय (भाकपा माले दिल्ली राज्य कमेटी सदस्य एवं एक्टू दिल्ली महासचिव), जीशान अहमद (दिल्ली भाकपा माले) एम्स ट्रॉमा सेंटर में इलाजरत शाकिर से मिले. शाकिर का बेड न. 2 सुनते ही गार्ड ने उन्हें बाहर जाने को कह दिया। कारण पूछने पर बताया यह बबाली मरीज है, इनसे मिलने देने से मुझे मना किया गया है। आधे घंटे के प्रतिरोध के बाद उन्हें मिलने दिया गया। उनलोगों ने वहां शाकिर से बात की तथा शाकिर ने उन्हें अपने घर का पता और अपने वालिद का नाम भी बताया. 25 जून की सुबह भाकपा (माले)- आइसा की टीम उनके परिजनों से मिलने उनके घर गयी. टीम में आइसा के राष्ट्रीय महासचिव संदीप सौरभ, जेएनयू आइसा की कार्यकर्ता गीता, दिल्ली भाकपा (माले) कार्यकर्त्ता जीशान अहमद और हरियाणा में भाकपा (माले) सदस्य कॉमरेड अनिल थे. यह रिपोर्ट इस टीम द्वारा जुनैद के भाई हाशिम व उनके अन्य परिजनों, पड़ोसियों और उसके दोस्तों से हुई बातचीत के आधार पर तैयार की गयी है. हरियाणा के बल्लभगढ़ से तक़रीबन 4 किमी दूर स्थित खंदावली गांव के रहने वाले जलालुद्दीन के परिवार के लिए आने वाली ईद की ख़ुशी का मौक़ा अचानक से गम और मातम से भर गया. उनके परिवार का होनहार लड़का जुनैद जो मेवात के नुह के एक मदरसे, फैज़-ए-सुभानिया में पढ़ता था, ईद की छुट्टी में घर आया था. उसने कुरान की पूरी पढाई पढ़ ली थी और यह उसके लिए हाफ़िज़ कहलाने का मौक़ा था. ईद का त्यौहार भी सामने था. घरवालों ने ख़ुशी-ख़ुशी अपने बच्चों को बाज़ार से कपड़े आदि खरीदने को पैसा दिया और ईद की तैयारी में लग गए. जुनैद की माँ का रो रोकर बुरा हाल था जबकि हाशिम एक कमरे में बिस्तर पर लेटा था. हमारी टीम को उनसे मिलवाया गया. जब हमलोग हाशिम से बात कर रहे थे तब वह बिस्तर पर लेटा हुआ था. उसे भी कई जगह चाकू लगे थे. कंधे पर, जाँघों पर और पैर में. हाशिम के साथ उनका एक रिश्तेदार असरुद्दीन भी थे. उन दोनों ने देशभर के अमनपसंद लोगों से मुद्दे पर आवाज़ उठाने की उम्मीद जताई. 26 तारीख को ईद के मौके पर भी वे इस मुद्दे को केंद्र में रखकर अपना विरोध जता रहे हैं तथा जुनैद के लिए न्याय की मांग कर रहे हैं. उनपर हमला करने वाले लोगों को तुरंत गिरफ्तार किया जाए और उन्हें सज़ा मिले. उन्होंने हमें बताया कि कई संगठनों और नुह मदरसा ने इस बार ईद के मौके पर विरोध जताते हुए काली पट्टी बांधकर नमाज़ पढ़ने का फैसला लिया है. वे चाहते हैं इस मामले को लेकर दिल्ली व अन्य जगहों पर भी अपनी प्रतिक्रिया दें, आवाज़ बुलंद करें; क्योंकि यह मामला जुनैद जैसे तमाम मासूमों का है जिसकी हिंसा और उन्माद द्वारा आये दिन हत्याएं हो रही हैं. समाज में और देश में ज़हर बोया जा रहा है. 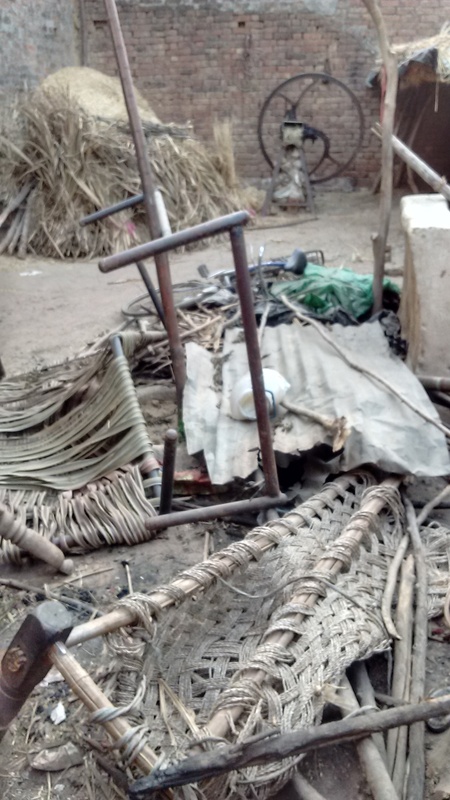 Saharanpur Carnage: Teaching a Lesson to Politically Assertive, Self-Reliant Dalits Who Refuse to be Foot Soldiers of Hindutva’s Hate Politics:When BJP gains electoral majority, Saharanpur happens. Reject the Politics of Assassination and Appropriation of Gandhi by the Communal Fascist Brigade! Gandhiji’s assassination on 30 Jan 1948 merits to be the first terrorist act and political murder of independent India. This year, we are facing 30 Jan in the backdrop of multi-pronged communal frenzy, resurgent moves to legitimise Gandhiji’s assassin by building Godse temples with calibrated indulgence by those in power. BJP MP Sakshi Maharaj’s statement calling Godse a ‘patriot’ obviously did not come from the blue. But, given the stature of Gandhi in popular imagination, BJP had to officially ‘distance’ itself and Sakshi too ‘retracted’ as a formality. Unmistakably, RSS-BJP is leveraging its power at the Centre for a calculated double-game, all geared to its core ideological agenda of crafting a ‘Hindu Rashtra’. On the one hand, politics of assassination of Gandhi is being legitimised by the saffron leaders/cadres on the ground with the implicit assurance that the govt will not act against them. On the other hand, image of Gandhi is being used as mascot of a govt programme – a crafty ploy that is intended to capitalise on the public stature of Gandhi, while at the same time recasting Gandhi in popular imagination as merely a mascot for ‘Swachhata Bharat/Clean India’ , thus cleansing Gandhi himself of his anti-communalism, syncretism and non-violence! And now, the cat is out of the bag, with Modi Sarkar first covertly omitting the words ‘secular’ and ‘socialist’ from the Preamble of the Constitution in the Republic day ad, and then its leaders- including the Union Minister of Communication and Information Technology Ravi Shankar Prasad openly calling for a ‘debate’ on these words in the Constitution!!! In the present phase of attacks on secular fabric of our polity talking about the deeper causes of Gandhi’s assassination will remain relevant till the attacks on secular democratic values continue to hover on the country. When Prime Minister Narendra Modi addressed his favourite constituency of non-resident Indians, promising them an India of “their dreams”, he asked them rhetorically: Gandhi gave us freedom, but what did we give him in return? 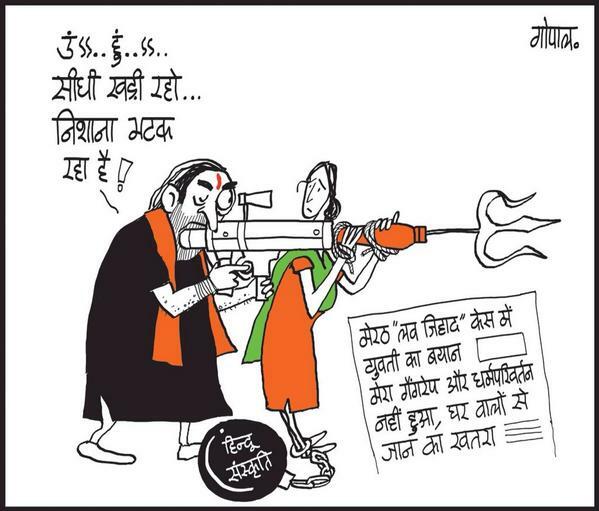 A wag remarked on Twitter: “Sanghis gave him a single bullet”. Actually, it was three – Nathuram Godse touched Gandhi’s feet before shooting him three times. Although the Rashtriya Swayamsevak Sangh (RSS) has always denied any responsibility for the assassination of Gandhi, there is no doubt that the conspirators were Hindutva ideologues. Gandhi has never really been owned by the RSS. Many in the RSS will even question why he is referred to as the Father of the Nation, because for them the idea of India precedes Gandhi by thousands of years. It is surprising, therefore, to see Modi, once an RSS-pracharak (proselytizer), invoking Gandhi repeatedly, most recently on his birthday, re-designated, Swachhta Diwas. During last many decades most Hindu nationalists have kept the appreciation of their hero, Nathuram Godse under wraps. With the new dispensation coming to power (Modi Sarkar, May, 2014), it seems these acts are being silently appreciated by those in power. This inference is logical as none in the positions of power have either reprimanded or opposed these Godse acolytes. The latest in the series of acts-statements by this Godse appreciation club is the bhumi pujan by Hindu Mahasabha for Godse temple in Meerut (Dec 25 2014). The activists of Akhil Bharatiya Hindu Mahasabha are all set to build the country’s first temple for murderer of Mahatma Gandhi in Meerut. There are several demands from the Hindu Mahasabha offices to install his statues. 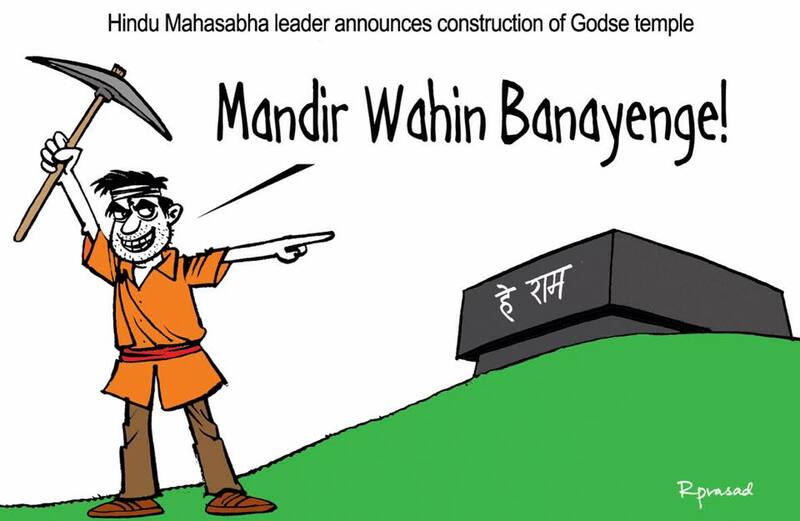 The Hindu Mahasabha has requested land from the Centre to erect a statue of Godse in the national capital. The paperback issue of Godse’s book is already running into second reprint. The BJP MP Sakhshi Maharaj recently called Godse as Nationalist; of course he retracted it soon; apparently to ensure that the ruling party, BJP, is not embarrassed on the issue. At the same time, BJP’s parent organization RSS has come out with two books meant for internal circulation. These books claim to ensure that RSS viewpoint is reached to its Pracharaks, swayamsevaks. These books are RSS-Ek Parichay (RSS-an introduction) and RSS-Ek Saral Parichay (RSS-a simple introduction), the second of which is written by veteran RSS member MG Vaidya. Essentially these books aim to dissociate RSS from Godse. How do we understand the whole issue? The major backdrop to understand the issue is to see the politics of Hindu nationalism as expressed through Hindu Mahasabha and RSS. These organizations remained aloof from freedom struggle. Hindu Mahasabha (HM), was more interested in the immediate participation in politics, as the flag bearers of Hindu communal politics, and the RSS wanted to concentrate on making a network of ‘cadres’ before forming organizations and infiltrating into different arena of education, culture, electoral politics and state apparatus. There was a lot of overlap in the agenda of these organizations as they were both working for the common goal of Hindu Nation. Nathuram Godse, ‘uniquely’ symbolized the fusion of both these two trends. RSS could get away with dissociating with Godse or rather underplaying Godse’s association with RSS as there was no official record of members of RSS, and so they could disown Godse at legal level. In 1930 Godse joined RSS and very soon rose to be the bauddhik pracharak (intellectual propagator). Like both HM & RSS he was ardent Hindu Nationalist. He held Mahatma responsible for appeasing Muslims, and thereby the formation of Pakistan. About his association with RSS and Hindu Mahasabha, he writes, “Having worked for the uplift of the Hindus I felt it necessary to take part in political activities of the country for the protection of just rights of Hindus. I therefore left the Sangh and joined Hindu Mahasabha. (Godse, ‘Why I Assassinated Mahatma Gandhi’ 1993, Pg. 102). As such Gandhi murder was not on the charges propagated by them (Partition and insistence on paying Pakistan’s dues (55 crore) from the treasury), but due to the basic deep differences with the politics of Gandhi and that of the followers of the Hindu Rashtra. These two reasons are proffered merely as a pretext for the same. So this is the logic of Godse saying that he ‘left’ RSS. The dual membership (RSS+Hindu Mahasabha) was not a problem. Thus the murder of Gandhi was steeped in both the streams of Hindutva politics, RSS and HM. His editing the paper called, ‘Hindu Rashtra was quite symbolic. This murder had a broad sanction of the followers of HM and RSS, as they celebrated Mahatma’s murder by distributing sweets, “All their (RSS) leaders’ speeches were full of communal poison. As a final result, the poisonous atmosphere was created in which such a ghastly tragedy (Gandhi’s murder) became possible. RSS men expressed their joy and distributed sweets after Gandhi’s death.” (excerpt from Sardar Patel’s letters to M S Golwalkar and S P Mookerjee.). Godse was no freak. The way Hindu communalists were spewing poison against Gandhi, it was the logical outcome of their politics. And Godse had the ‘benefit’ of the teachings of both RSS as well as HM. They used the word ‘wadh’ for this murder. This word wadh stands for killing a demon who is harming the society. So though officially RSS family kept dissociating from Gandhi’s murder by Godse, in private many members not only uphold the dastardly act, but also have even succeeded in undermining the importance of Mahatma and they do ‘sympathize’ with Godse. This complex trick kept going on so far. Now with Modi Sarkar there is no need to hide the true ideology and thinking of this combine and so the open efforts to glorify Godse! Com. Sudhansu, AISA’s State President of UP Expelled by Lucknow University Administration for Organising Talk on Women’s Right to Choose! Who is Afraid of Love? On 15 November 2015, the AISA unit of Lucknow University (LU), held a convention on the campus premises on ‘Prem Se Darr Kisko?”(Who is afraid of love? Love Azaad vs. the lie of Love Jihad) The convention was organized in the light of the increasing communalisation of love in Uttar Pradesh by the RSS/BJP machinery. The urgent need to dispel the myth of love- jihad was further necessitated by the spate of provocative statements and threats being issued by BJP leaders like Yogi Adityanath on a daily basis and the falling apart of the mythical love-jihad propoganada by the sangh machinery after it came to light that in the much hyped love-jihad case of Merut, it was actually the local BJP leaders who had threatened and subsequently bribed the family members of the girl to falsely accuse their daughter’s Muslim partner. 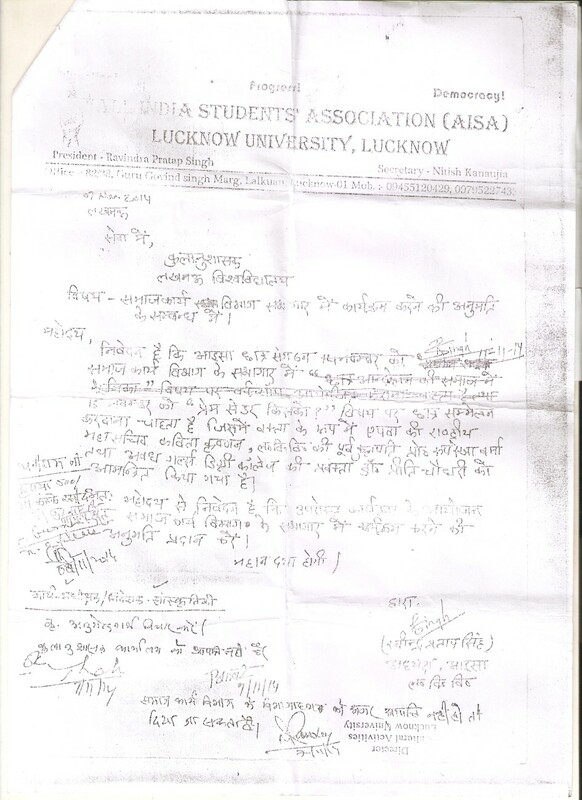 The AISA unit of LU obtained formal permission from the university authorities for organising the convention (permission letter attached). However, on the day of the convention, when CPI (ML) Liberation’s Politburo member and AIPWA national secretary Com. Kavita Krishnan was about to deliver her talk, the ABVP goons entered and vandalised the convention venue, manhandled the speakers and other students (especially women) among the audience and disrupted the talk. While disrupting the talk they proudly raised pro-khaap and pro-moral policing slogans while also threatening those against their regressive, patriarchal, communal and parochial views with ‘goliyon se aarati‘ (salutation by showering bullets). Most disturbingly, the University authorities with whom layed the responsibility to ensure that such disruption does not happen, chose to collude with the vandalists. That all this happened in a state university of a state whose ruling party claims to be the most fervent upholder of secular values, is a serious give-away not only of their false claims of standing for secularism but also to the heightened fear and insecurity the minorities must be experiencing every passing moment. Two months later, in a most shocking and disturbing turn of events, the University authorities who had earlier failed to rein in the vandalists and also failed to ensure that the university campus remained a space of critique, democratic dialogue and freedom of expression, instead of coming down on the disruptors of academic and secular spaces has chosen to take action against those who stand for democracy, secularism and rights of women. LU authorities have now issued orders to expel Com. Sudhanshu, state AISA president and a student of LU, for standing up for the rights of women to make their own decisions, for having challenged sangh brigade’s unabated hate mongering and for having the courage to stand for ‘love’ during the time of ‘hate’. At this juncture, it becomes all the more important to ask ‘Who indeed is afraid of love’, so afraid, that they would rather let vandalists and goons run loose and unreined in the university than safeguard the democratic, egalitarian and secular ethos of institutional spaces! What kind of University feels threatened when issues of ‘women’s right over their bodies and choices’ are raised? What kind of university allows open threats and intimidation of women and then follows it up by penalising those who stood with the women resisting such threats? 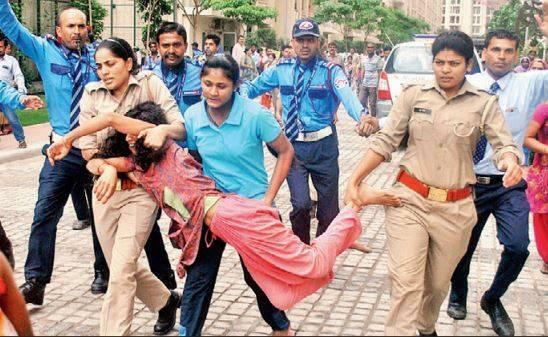 What kind of university shuts its eyes when a group such goons throw money at girls dancing on a stage during an college event (as reported by the female students on the day of the convention) but suddenly wakes up when the same women bravely stand up and assert ‘no more’!! And also, what is about the state government’s mindset, that university authorities feel so emboldened to punish those who stand against the sangh brigade’s hate mongering and daylight lumpenism!! In recent times we have seen how educational institutions are becoming brazenly anti-women and instead of creating spaces for questions and critiques, are instead going all out to curb them. From beating up Jadavpur students at midnight for daring to demand justice for a fellow student, to issuing show cause notices to students for organising events in order to assert people’s rights over the spaces they daily occupy. Last month, the authorities of Calicut Universities had issued show cause notices to common students and several left activists including those from AISA for organising a “Hug of Love” event in their college on 10 December 2014. At a time when the self-appointed guardians of morality have been busy spreading “hate” through divisive speeches and campaigns like “love-jihad” targeting different communities, the students’ of Calicut Law College had undertaken this initiative to ensure that we remember love, the most unifying of human emotions. By issuing show-cause notice to the students, the Calicut Law College administration violated a key principle on which any institute of higher education is founded, which is, that there be presence of critical thought and freedom of expression, and the college/university administration is beholden to safeguard that freedom. Though the university later was forced to withdraw the notices under tremendous pressure from progressive sections it nonetheless showed itself to be replete with the very regressive and irrational notions that it must instead be striving to replace. By bowing down before communal and patriarchal forces, the LU too has shown itself to , be an unthinking agent of the status-quoist and right-wing forces in the state, when it considers a convention on love, secularism and women’s agency as immoral, problematic and an unfit topic of discussion among students. We appeal to all democratic section to unite against the expulsion of comrade Sudhanshu and build up a massive resistance against shameless surrender of LU administration to right-wing hate mongering forces. See NO to Homophobia! NO to Misogyny! Even as the Modi government launched a much publicised ‘Swacchata Abhiyaan’ (cleanliness drive) on 2 October, with the entire media broadcasting stories and visuals of the Prime Minister Modi, Ministers, bureaucrats and celebrities sweeping roads, AISA and AICCTU ran campaigns in Delhi stating clearly that no real ‘Swacchata Abhiyaan’ was possible without ensuring sanitation workers’ rights. In JNU, a ‘Pledge for Rights’ (Adhikaar Shapat) programme was organized on 2 October, highlighting the Modi government’s criminal silence on sanitation workers’ rights. 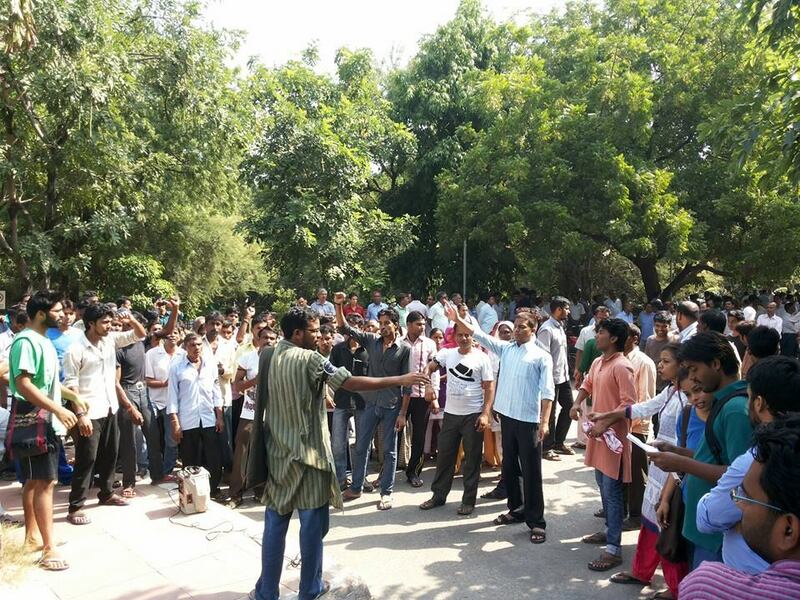 Even as the JNU administration organized a cleanliness drive as per the diktats of the Modi government, with brand new brooms being provided to the JNU administration officials, around hundred sanitation workers along with several students and teachers participated in the parallel protest with black bands tied around their arms. They read a pledge which demanded an end to contractual labour and an immediate abolition of the horrific practice of manual scavenging not just in the law but also in actual practice. The pledge also demanded implementation of workers’ rights such as wages, bonus and PF which have been systematically denied to sanitation workers across the country. At the Satyavadi Raja Harishchandra hospital in Narela, AICCTU has been organising a protracted struggle to ensure basic minimum workers’ rights for the safai karamcharis employed in the hospital. On 2 October, a hunger strike and protest was organised at the hospital against the forced retrenchment of 22 safai karamcharis who had been working on contract in the hospital and against the systemic violation of sanitation workers’ rights. The workers pointed out that even in institutions run by the government, such as government hospitals, exploitation of sanitation workers is rampant. In the Harishchandra hospital, minimum wages are not paid, workers are forced to work for 12 hours every day without being paid any overtime that too without any safety equipment such as gloves. They cannot avail of weekly holidays, and are denied the legally mandated PF and ESI benefits. Moreover, after opening bank accounts for the sanitation workers, the contractor in charge of the sanitation work in the hospital has illegally confiscated the passbooks and cheque books of the workers and is forcibly getting the workers to sign on blank cheques. The hunger strike on 2 October by the sanitation workers on in Narela raised all these issues, even as the workers organised a cleanliness drive on the roads near the Harishchandra hospital. 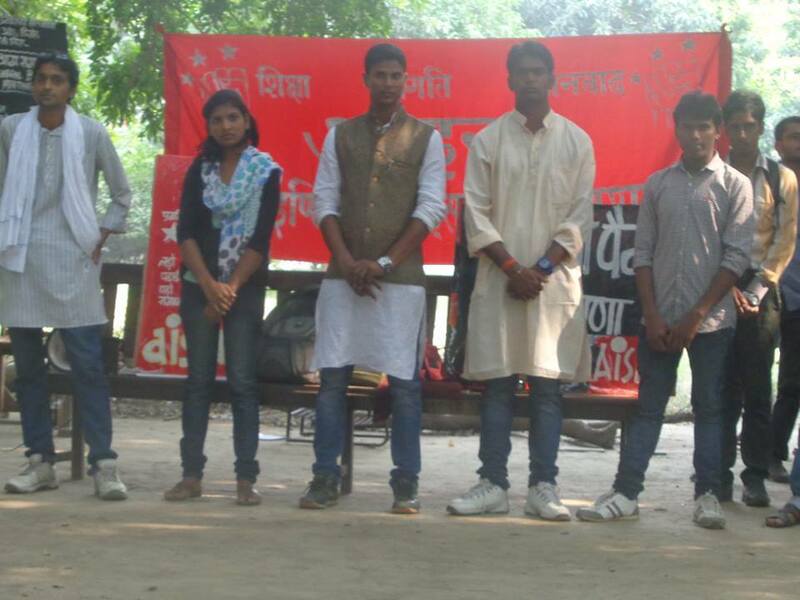 AISA Wins the Post of Vice-President in the Allahabad University Students’ Union (AUSU) Elections! A Significant Advance of Students’ Agenda Against the Politics of Muscle Power, Dominant Power-Lobbies and Communalism! In the AUSU elections this year, 2 out of five central panel posts have been won by the Left forces, while much hyped ‘saffron wave’ got reduced to 1 post! 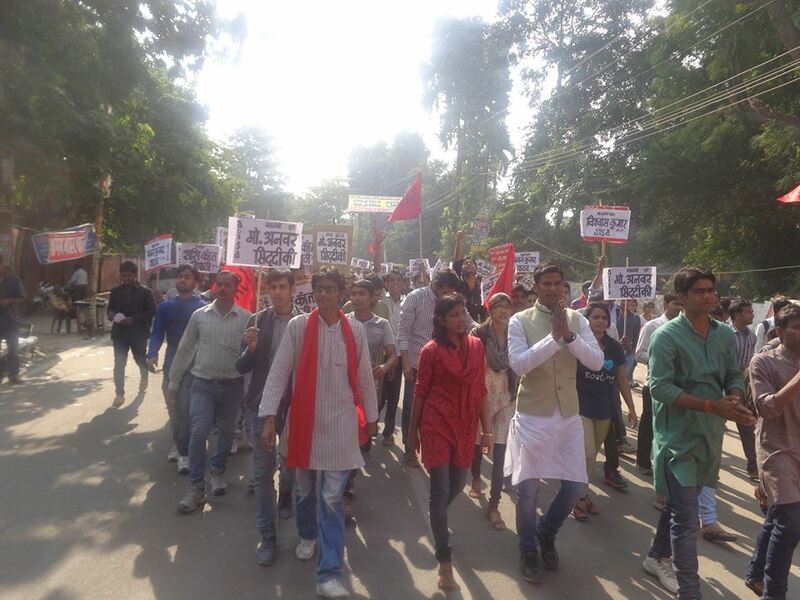 The verdict of the Allahabad University Students’ Union Election held on 21st November has manifested the aspiration of common students for a fundamental change inside the University for democracy, equality and struggle for students’ rights amidst an overall atmosphere of violence and lumpensim created by dominant casteist lobbies and ruling class political parties. Comrade Neelu Jaiswal from AISA has won the post of Vice-President and comrade Vidyotma Maurya has been elected as the PG/Research Scholar representative from Arts Faculty. Comrade Pawan Kumar from AISA gave a tough fight to ABVP representative for the post of Joint Secretary and polled second in the post. Other than AISA comrades, two representatives from AIDSO- comrade Ankush Dubey as Cultural Secretary and Comrade Vimsingh Chandel as UG representative from arts faculty have also got victory in the election. The democratic space within students’ politics in the city has been strengthened by the victory of two left representatives out of five Central Panel Posts in AUSU. ABVP, the student wing of the RSS, which was trying to cash on the claimed NaMo wave got a major setback in the final results with only one post by a slender margin. The post of President and General Secretary have gone to Samajwadi Chhatra Parishad, the student wing of the SP. Among the contesting forces in the election it was only AISA that kept the spirit of democracy, social justice and gender equality alive. While most of the candidates were busy displaying dominance of caste combinations, money and muscle power, it was only AISA that made the rights of common students and deprived sections an agenda of the election. The academic atmosphere of AU is marked by absence of basic minimum infrastructure and facilities. Books are not issued from the central library of the university. Most of the students do not get hostel and are forced to live in tiny sized rooms in rent. Most of the teaching posts are lying vacant and regular classes are a far-fetched dream of the students. Basic minimum facilities like photocopying, canteen or laboratories with updated instruments are absent from the university. In such an atmosphere of academic anarchy, it is only AISA that has built up movement demanding these facilities throughout the year and has made these issues a fundamental point of election campaign. In contrast to this, the rest of the forces and student wings of the ruling parties, be it SP or BJP, tried to cash on their position in power and opportunist combinations to mobilize votes. Devoid of any pro-student agenda, they contested the election by trying to polarize the campus on caste and communal lines. Several incidents of lumpenism targeting teachers from minority community, use of sexist abuse targeted at them or spreading the lie of love jihad were part of their pre-election preparations. Along with raising issues of academic rights of the students inside the university, AISA also took up the task to expose the anti-people policies of these governments. Our campaigners and candidates urged students to make student wing of the ruling SP accountable on the question of increasing attack on women and dalits in UP under SP rule. The betrayal of the SP government on the question of social justice by not implementing the three tier reservation in Public Service Commission posts has also been exposed by AISA. The question of increasing unemployment in UP while thousands of government posts are lying vacant for years in UP was a part of election campaign of AISA. When the ABVP representatives thought they can win elections by naming NaMo, AISA comrades made them accountable among the common students on the question of CSAT, scam in SSC results, price rise, black money and communalization of academics and society. The entire election process be it nomination rallies, election campaign or post-verdict violence has exposed the farce of Lyngdoh Committee Recommendations. AU administration was a complicit witness to the open violence and show of money and muscle power by ABVP, SP and other dominant lobbies. Flouting all election norms, lakhs of rupees have been spent by the candidates. Big campaign hoardings in the city, luxury cars and lakhs of printed photos were all part of campaign by the lumpen and ruling class groups. Nomination rallies of these forces were marked by several rounds of firing and bombardment. Rampant violence between groups of candidates was common throughout the election period. In one such incident, a group of lumpens tried to attack our women comrades when they intervened to stop fatal attack on another candidate during campaign. Immediately after the results were declared, ABVP goons started firing throughout the city and created hooliganism and violence. Along with ABVP, goons led by the outgoing president of AUSU who was supporting the anti-reservation lobby in the election, attacked the residence of the Election Commissioner. It is a real irony that Lyngdoh Committee which was introduced in the name of scuttling money and muscle power in the student union elections is only used to scuttle democratic rights and space for democratic forces in student politics (as is happening in JNU). The result of the AUSU has encouraged the democratic movement and aspiration in the university. In the coming days, AISA is committed to carry forward the struggle against the dominant power lobbies and communal forces, against the anti-student regimes of the SP in UP and BJP at centre under the banner of AUSU and the progressive forces elected in the students union.